In a marketing campaign, we always need to seek out the possible ways of staying competitive with our main rivals. We try to be as distinctive as possible so that we can attract more customers to purchase our products. One of the best ways to do this is by introducing a marketing gift. 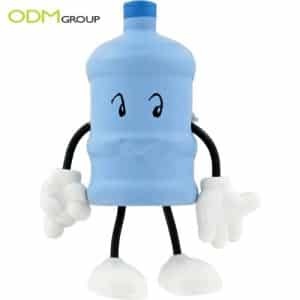 Here, we are going to elaborate more about water bottle figure stress balls which can be an innovative, cheap and practical promotional product. These stress balls can be introduced in a marketing campaign of any industry like the drinks industry. How does this marketing gift create brand awareness amongst our target market? In marketing, we need to deliver our messages to the right audience such that it would leave a deep impact on them. If we keep our ideas simple and logical, we will obtain positive outcomes. These water bottle figure stress balls are unique and really represent what we are promoting. The mold can easily be adapted to any product you sell and make your brand stand out from rivals. What are we looking for? Simplicity and efficiency. Something that is inexpensive and can be included as a giveaway of a certain promotion. It would be great if it can be used as a marketing gift for customers that spend a minimum amount of money in the purchase of your products. Also, the practicality of this promotional product will guarantee that the client will use it in stressful situations like during working hours. They could be consuming a beverage purchased from your company and using your stress figure to calm down and relax at the same time. A break is much needed by the working population during busy times. Brand this inexpensive product to raise brand awareness for your company! Always keep in mind on how to convey your marketing ideas to the public so that it will stand out from the rest in order to obtain a competitive advantage.